This classic gentle soap contains finely ground oatmeal and nourishing honey. Its creamy mildness makes it perfect for everyday use by those with sensitive skin. 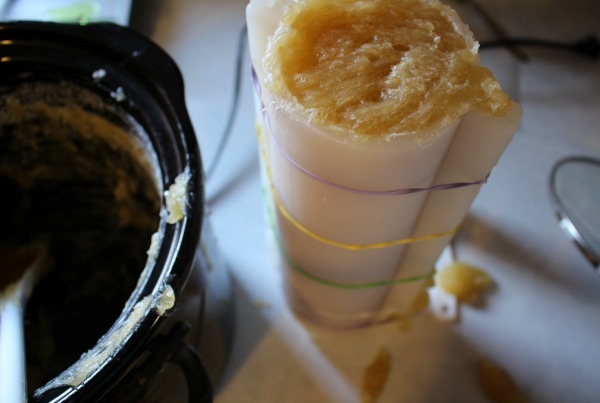 By cooking soap in a crock pot (hot process method), you can bypass the several weeks of waiting time that cold process recipes usually require and use your homemade soap right away! UPDATE! I made a video of this soap! PS: This is my first Facebook video! Would you like to see more? If so, what would you like to see me make next time? Oils, liquid and lye should all be measured by weight. You must use an accurate scale to make soap. *Yield of this soap is almost 42 ounces, or 2 lbs 10 oz. (Yield is calculated by adding weights of oil + liquid + lye). *If you’re allergic to coconut oil, try using babassu oil instead. You will need to change the lye amount to 3.8 ounces, but otherwise follow the recipe as is. *If you don’t have castor oil on hand, you can just use more sweet almond or sunflower oil instead. If you can’t use sweet almond oil, try avocado, apricot kernel or even more olive oil instead. It’s such a small amount, it probably won’t change much, if any, but just in case – run your new recipe through a lye calculator and see how much lye they suggest. *The tamanu oil can be replaced by most any light oil or melted shea/mango/cocoa butter. Its purpose in the recipe is to add extra moisturizing skin benefits. Since the soap is fully cooked when you add this extra oil, you don’t have to adjust the lye amount if you omit or change it up. This recipe was made in a 4 quart slow cooker/crock pot. (THIS is the model I have.) My crock pot runs a little warm and heats up fast. 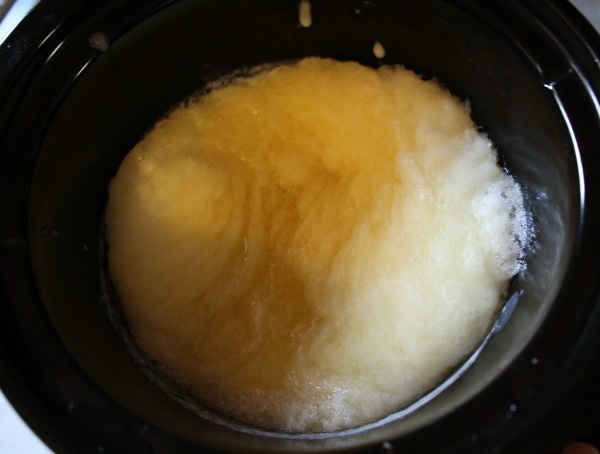 If you have an older crock pot that’s slow to warm up, you may need to preheat it before adding your oils. Don’t use aluminum equipment or utensils when working with lye or uncooked soap batter as they’ll react negatively with the lye. When working with lye, you’ll need to wear a pair of rubber gloves, long sleeves, and safety goggles in case of splashes. Keep children and pets out of the room while you work. Fill a heat proof plastic or stainless steel container with 10 ounces of water, by weight, and set it down into your sink or on a safe spot on your counter. Pour the lye into the water and stir until completely dissolved. The lye will get extremely hot and give off very strong fumes during this time. Work at arm’s length in a well ventilated room and avoid breathing the fumes in directly. Set the lye solution aside to cool while you prepare the oils. Using a digital scale, weigh out 8 ounces of coconut oil (or babassu oil if allergic). Melt the oil in a small saucepan, on low heat. While the coconut oil melts, weigh out the olive, almond and castor oils and pour them into your slow cooker’s stoneware liner. Add the melted coconut oil to the other oils. Still wearing gloves, goggles, and long sleeves, carefully pour the lye solution into the combined oils. Stir the mixture using a stick or immersion blender. (THIS ONE is the kind I use.) For best results, alternate stirring for twenty to thirty seconds at a time with the power off, then the power on. 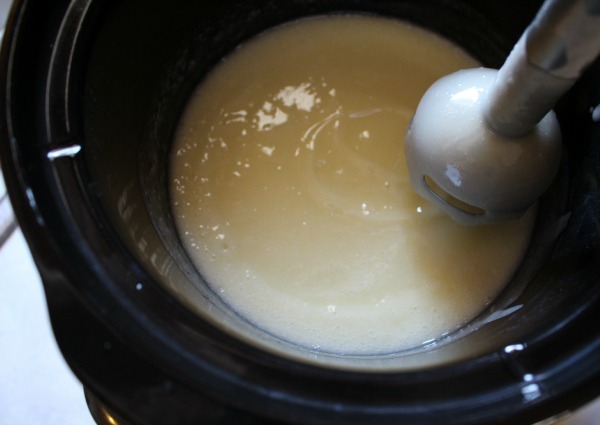 If you run the stick blender continuously, you could burn out the motor, cause a false trace, and/or introduce a lot of air bubbles into your soap batter. Stir until trace is reached. “Trace” means that the mixture has thickened enough so that when you drizzle some of the soap batter across itself, it leaves a visible trail or impression for a few seconds before sinking back in. This soap is high in olive oil which means it might take a little extra time to reach trace, but it shouldn’t take longer than seven to ten minutes of stirring. 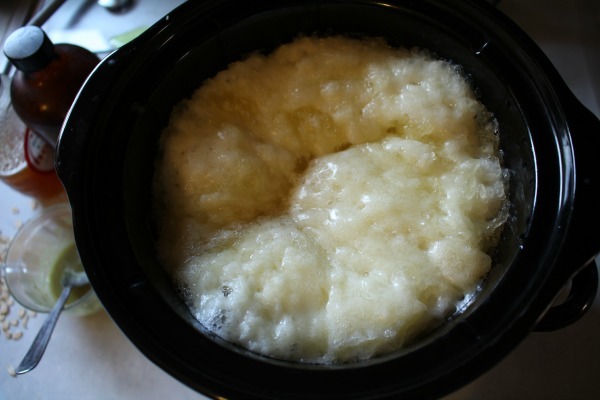 Set the slow cooker liner, filled with soap batter that has reached trace, down into its base. Turn the heat to low and cover your crock pot with the lid. Now, cook your soap for one full hour, on low. I like to set a timer to check on mine every fifteen minutes to see how it’s doing. You may need to stir it down, but I usually don’t worry about stirring, until the hour has passed. While the soap is cooking, measure out the tamanu oil, honey + water, finely ground oats and lavender essential oil (if using) in small bowls. Set these aside until needed. Once 60 minutes of cook time has passed, stir the soap then let it cool uncovered for 10 to 15 minutes. Honey tends to scorch when it gets too hot, so this cool down time really helps make that less likely to happen. Stir in the tamanu oil, lavender essential oil (if using), honey + water mixture, and the ground oats, then stir, stir, stir, stir! You can also use a bread pan, lined with parchment or freezer paper, or even a small (lined) shoe box. Let the soap sit in the mold for around 24 hours. Cleanup of your crock pot is easy. Just set it into the sink and fill with warm water. Let it soak for a while and the soap residue will rinse right out. Step 7 – Slice into bars & enjoy! Once firm, remove the soap from the mold and slice into bars. You can use your soap right way, but it will last longer if you let it cure for three or four weeks first. This recipe makes around 9 soap rounds, but if you use a loaf shaped mold, it will probably be more like 7 or 8 bars. 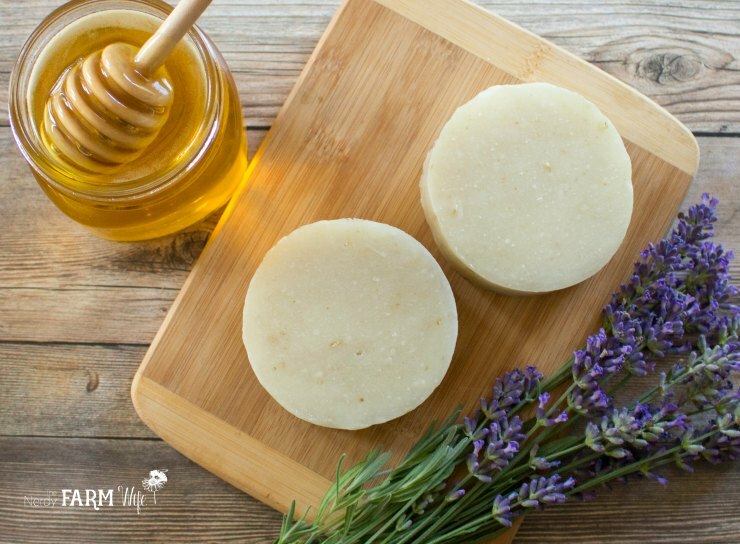 If you enjoyed this soap recipe, be sure to sign up for my newsletter HERE to get my best herbal projects, soap ideas, and DIY body care recipes sent straight to your inbox, once per month. Tagged crock pot, honey, hot process, oatmeal. Bookmark the permalink. Thank you for this recipe. I can’t wait to try it! Can you double the recipe without recalculating the amount of each ingredient? Hi Jacqueline! Normally, if you keep the same ratio of oils, then the same ratio of lye should be needed to turn them into soap. For example – you need 0.13 oz of lye to turn 1 oz of olive oil into soap, and 0.26 oz of lye to turn 2 oz of olive oil into soap, and so forth. So, you can double this recipe without needing to make significant changes. However, you will need to use a larger crockpot to cook it in, which might affect how long the soap cooks. I don’t want to order any of the special oils; can I make this with just olive and coconut oils? Also, why worry about “gluten free” when oatmeal does not contain wheat gluten anyway and, at any rate, you will hopefully not be eating the soap? Do you know what gluten is? Most people don’t, and therefore the hysteria continues. but just make it in your crock pot instead, adding the oats & honey at the very end. Three of the four of us in my house have celiac disease, so we have unfortunately been well informed on gluten’s properties for almost 12 years now. Quaker Oats states on their web site that they aren’t gluten free due to cross contamination issues during harvest & transport, so we buy specially grown gluten free ones for baking at our house – but you are right that many people don’t need to worry about that aspect and hopefully no one will be eating their soap! “Do you know what gluten is?” Do you know how condescending you sound, especially when she’s been clear her son has numerous allergies? No one questions why people with peanut allergies may desperately need to avoid cross contamination in products that contain no actual peanuts; why do people beat down so hard on people with celiac, who must do the same thing with gluten? Many specialty grain companies use the same mills for oats and for wheat or other gluten grains, so there can be traces of gluten in the oats. Gluten free oats are flattened or ground in equipment that is used for oats and oats alone, so no other kinds of grain could be included. I haven’t yet started making soap because it is all confusing to try and figure out. 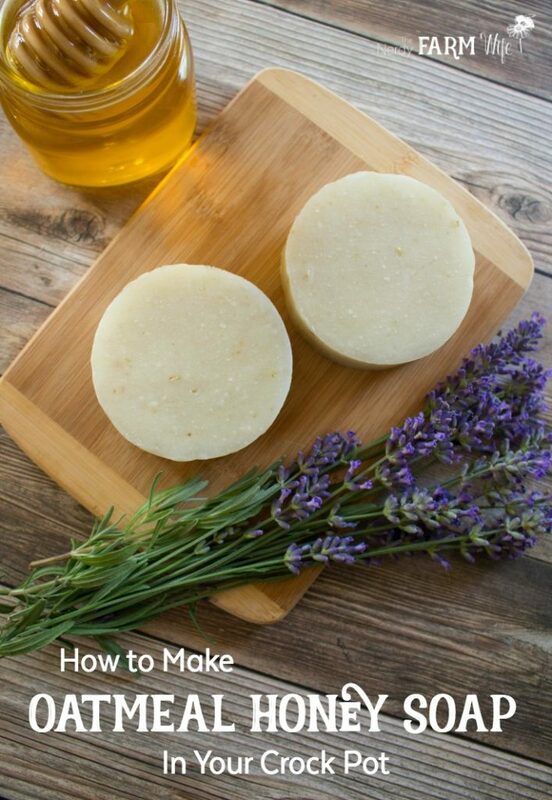 This one has such simple instructions I’m going to try it for my first soap. One question, could jojoba oil be substituted for the meadowfoam oil? Thank you for making this easy to follow for a beginner like me! Hi Amber! Yes, jojoba can be used instead of meadowfoam and will be quite wonderful in this recipe! I made this soap a few days ago…it is lovely. My daughter in law and I poured into a prIngles can. It set up nicely and smells heavenly. Thank you for the recipe! Love the Pringles can idea!! Starting out in my soap-making, I didn’t have any molds so I started using the abundance of raison containers my family goes thru. I love them! 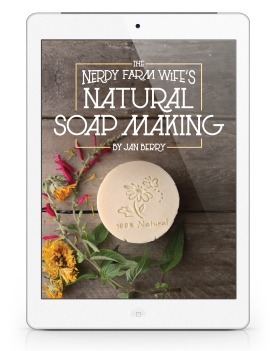 Love the honey oatmeal soap recipe. Cant wait to try it. Love this site. Love your website. I have only made 10 batches of hot process soap, never tried cold process. I love using Pringle cans. Thanks for great recipes! Thanks for all that you do & I sincerely hope the holidays were good for your family. I have been reading up all over the place on making soap & I am ready–supplies finally in hand–to start my first batch. I really want to make hot process soap because of the “age” times involved with the cold process soaps. I was wondering how long it would take to hot process soap on the stove–I have a granite ware stock pot that boiled water sticks to, but think it will be just fine for soap making–rather than in a crockpot. It looks as though it was like 90 minutes tops for this recipe in a crockpot. I thank you & anyone else that may answer this question in advance. I’m sorry I missed your comment until now. Sometimes I get a bunch at once and a few sneak past my attention! I’ve not tried this recipe on the stove top, but it should be a similar process. Since the heat is just from the bottom, you’ll probably want to stir it frequently though, instead of skipping stirring like I did. You could also try HPOP (hot process oven process) The Soap Queen blog has a great tutorial! So yes, looks like you should stir a lot when cooking your soap this way. I have made old fashioned hot process kettle soap for many years. Kettle soap just means that a large amount of hot process soap is made at one time, generally over an open flame. I use a very large stainless steel canning pot. When you are heating your soap on a stove top, grill top, or open flame you do have to stir often. You will also need to watch your soap carefully if cooking on either a grill top, or open wood fire. I use a grill top, which I can tun up or down to control the temperature. This also means that I make my soap outside. I usually make about fifty or so bars at one time. It is a lot of work, nut to me it is well worth it. Best of luck, hope you enjoy soaping as much as I do. Hi Jan! I can’t wait to try this recipe! It looks pretty easy and fun. Can I omit or substitute tamanu oil or rosehip oil? I don’t have any and I want to make this tomorrow without having to wait on a mail order. (patience is not one of my virtues!) I do have Grapefruit seed extract or apricot kernel oil, if either of those can be used. Also, Pringles cans are lined with foil. Is that a problem with hot process soaps? Thanks! Hi Janean! Instead of the tamanu or rosehip oil, you can use any skin loving oil OR melted shea/mango/cocoa butter OR just omit it. Once the soap is cooked, the extra amounts are really flexible and you can get crazy creative with add-ins. Apricot kernel oil sounds like a perfect replacement though! That’s good to know about the Pringles can; we can’t eat them since we’re gluten free here, so I wasn’t really sure what they are like inside! Since cooking the soap puts the pH in a safe range, then the foil lining shouldn’t be a problem. I don’t think you’d want to use foil lined anything for cold process though. I just tried making this soap, and it was an epic fail :( I should also mention that it was my first time ever making soap, so I’m quite sure it was my error. 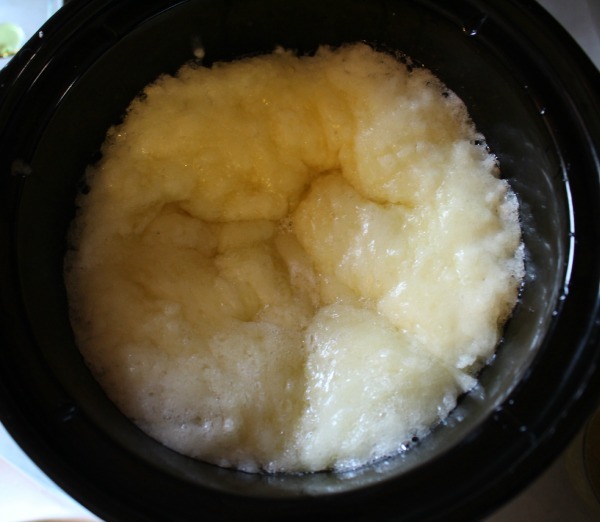 It appears that the soap seized up in the crockpot, turning into a solid mass. It never bubbled up like your pictures. I tried adding the ingredients at the end, and of course they did not incorporate well and turned the soap a dark orange. I tried to smoosh the chunks into a mold, but I don’t think that is going to work out so well. Should I just chuck it and start again? I’m wondering if I overdid the mixing. I thought it reached trace well before the 7-10 minutes, so I kept going thinking surely it wasn’t finished yet. Now I’m thinking I should have stopped sooner? Would that cause the soap to seize up? I’d love to give it another go soon! Thank you Jan! I’ll have to see about salvaging it. Might be a good experiment to try! I was so eager, so I went ahead and tried another batch. I was more careful about reaching trace, which actually took about as much time as it said in the instructions this time. I’m wondering if my lye was why my first batch solidified quickly. I mixed the lye outside and let it cool outside for 15 minutes, and it’s a cold day. Perhaps it got too cold? The second batch I only left outside for 8 minutes, and I think I will have usable soap! It still didn’t bubble up like your pictures (probably because I turned the crockpot on but didn’t have it plugged in for half an hour!) I’m going to try a 3rd batch tomorrow. I will remove the soap mixture from the crock before adding the honey/oatmeal mixture. It started getting orange again, but not as dark as the first batch. I did not realize that making soap is so much like a science experiment! Thanks so much for this idea!! I started out making hot-process soaps and absolutely love it!! I’ve been wanting to try a soap with honey, but have been scared for all of the things I read about scorching and my soap is already “hot”. Thank you for all you share!! You are so inspiring and helpful with all of your detailed information. And fun to read with all of your wit and humour! I’ve made 2 different cold process soaps (I’m still waiting for both) and have tried the hot process for a basic (no scents added) recipe one time before trying this recipe today. I was a bit nervous about the hot process because I really wanted this one to work out and my one attempt at the hot process was difficult to work with when I was ready to mold it. It was dry and already seemed to be solidifying. Well, I was pleasantly surprised at how easy this was to mold. I used a Pringles can and because I was nervous about the consistency of the soap I cut the Pringles can in half thinking it would be easier to spoon the soap into it. I had to be a little careful with the end that had the lid as the bottom but it went very well. This combination of oils took a little longer to trace but was almost as easy to mold as the cold process recipes I used. As it was cooking it looked just like the pictures and I’m confident it will turn out. When I put the crockpot in the sink and started filling it with water the bubbles it made were so soft. I think this is going to make a fabulous soap and will probably use this oil combination as a base for all my soaps. Can’t wait to be able to un-mold it and see what it’s like. And of course use it! Thanks for the great tutorial! You said to add the eo’s at trace but this a hp recipe… Shouldn’t they be added after the cook? Oh goodness! Thanks for pointing that out! You are correct. EOs, honey, oatmeal & tamanu oil are all added after cook time. I’m so used to cold process format, I completely forgot to change it for this HP recipe. I appreciate your heads up! Kyle Anne, is it easy to remove the soap from the Pringles can? How did you unmold? Could you please explain the process? Thanks. I apologize! I hadn’t seen your question. It is very easy to unmold from a pringles can. I simply cut into the top of the can and peeled it away. I guess if you line it you can re-use it but I just peel and toss! Thanks so much for the recipe! I do cold process all the time, but rarely do hot process (aside from rebatching from time to time). The recipe went exactly as described, and smells amazing. It’s in the mold now and I can’t wait to try it out! This recipe looks very interesting but I don’t have a crockpot and not keen to try the hot process method. Would this recipe work with the cold process method and I just add the oatmeal, honey and rosehip oil at trace? Or I should rather find a different recipe? Hi Ru! Yes, that’s exactly what you’d do – add those items at trace instead. Hot Process is almost the same as Cold Process – with HP just having an additional step of cooking, to speed things along. Hi! I make cold process soap and was just wondering if you use your crock pot just for soap making only? Do you this same crock pot to cook food in? Thanks! Hi Carolyn! I was using an old crockpot for soap making, but in a fit of spring cleaning, threw the base out. (Oops!) So, I tried using my good crock pot instead. I thought it would be okay, but after two batches of soap, I could clearly see some etching and wear starting on the inner liner (and it was a fairly new crock pot.) I just didn’t feel comfortable re-using it for food, so I now use that formerly “good crock pot” for soap making only and need to buy a new one for our meals! I know some soap makers use the same equipment for soap making as for cooking though – so it may be a personal level of comfort thing. I have done a few hot process soaps before. I have used silicon loaf or muffin pans before with great results. I have also used a pvc pipe, 2 or 2 1/2 inches wide, lined with parchment paper. Just be sure to have an end wrapped tight with rubber bands to secure it really well, especially if you want to tap it down. To make round soaps I use clean Pringle Potato Chip cans. I enjoy the chips and then I enjoy the can. Hi Denise, Thanks for the kind words and sharing your story! That’s wonderful that you’re letting your little granddaughter do things with you as well! She is really going to treasure those memories. Grape seed oil does have lots of benefits – it’s light and absorbs easily into the skin. It’s also a good choice for those with acne. The only real drawback that I know of, is its short shelf life (6 months or so I believe). I don’t use it as much as I’d like to, but that’s only because it’s not as available to me as olive, coconut, sunflower and castor oils. I need to order some more oils soon, I’ll have to get some and try it out in a few recipes! Hi Melissa, Yes, they sure can! Hot process is just cold process soap with one extra step of cooking it so you can use it sooner. The only difference is the stuff you add at trace in cold process recipes, should be added after hot process cook time instead. When curing, should I cover the bars or just stand them upright? Hi Karen! You don’t have to cover the bars, just stand them upright. Hi Jan! I just wanted to say thank you for your thorough tutorial on the hp method. I made my first batch last week and it is heavenly! I did not use all the oils you mentioned but what I had on hand being canola, coconut, jojoba, castor and grapeseed and ran it through a lye calculator before beginning. I also used a pear FO that I had on hand since the lavender didn’t seem to go with this particular recipe. I just love the way it turned out. Thanks again for your wonderful site! Should the molds be covered? thank you! Also I have made two batches now and the soap is not getting hard-is that normal? I mean it’s firm but it if you squeeze it it feels soft. Hi Karen! It probably needs a little more cure time in the open air to dry out a bit. I tend go on the high side with water when I make hot process soap, so it’s smoother and easier to mix, but you could decrease it by an ounce or so if you’d like and see if that helps it to get solid faster. My first batch has been sitting for about 2-3 weeks. Is that long enough? Maybe it’s my coconut oil. I didn’t want to use my organic stuff so I used the cheap stuff from the grocery store. Hi Karen! I’m so sorry that I missed this comment! Sometimes a bunch come in at once and I don’t get to see them all. How did your soap ever turn out? I had to stop using grocery store oils too. I love their convenience, but they were getting unpredictable for me! Is it necessary to have a crock pot designated only for the soap making–or is it safe to use one that will be used again for cooking? Hi Gayle! I’ve seen people on both sides of the fence on this issue. I like to use a separate one since after just a few uses, you can see wear in the bottom from the stick blender. Some soapers though use the same equipment, washed and rinsed very thoroughly. I think it’s probably a matter of personal comfort level. Hi!.. this looks great for me to use for myself since I have eczema! I’m new to soap making and am trying to learn how to make my own recipes for hot process. Can you please help explain what formula you use to calculate how much and what types of superfats to add. I’m having trouble because the lye calculators I’ve found seem to apply more to cold processing where you can just discount the lye based on total weight. I want to make sure all the lye is used by my base oils. SoapCalc is good, but it was very complex for me when I was first learning, so I like the two above for being easier to understand. The one main difference between cold process and hot process is, like you said – the superfat stage. For cold process, if you add extra oil at trace, it all gets saponified, so should be included in your recipe to make sure you have the lye balance correct. For hot process though, if you add oils after cook time, they won’t be used by the lye, so are more like bonus oils. Don’t calculate them in the recipe, but do know they’ll make your bar more moisturizing, so you might want to superfat your HP soap at 5% (rather than the 6% you might use for CP) if you’re adding extra oils after cook time. I hope that helped explain your question, but if not, let me know! Can you double the recipe, or should I make it in batches. Hi Lisa! You could double it, but you’d have to use a large crockpot and I’m not sure how well it would cook throughout. I haven’t tried doubling it, to know for sure how it’d do, so would recommend making it in batches. I just made my first batch. I’m using mint herbal water. A friends daughter has been begging her mom. I told her, I would give it a go. It has bubbles in it. I presume that I need to smack it harder on the counter. In the Pringle container, you have to use an ejactor. knife, and slowly cut down, an very gently doen the edges. Not a big deal. With the soft bars, I simply rubbed them out. No mint smell. But they are still yummy. Thanks for letting me know how the Pringles container worked – I’ve been curious about that! I just saw this and have very sensitive skin and wanted to know if soap would work without the lye. Hello! Thank you for sharing this recipe, it sounds lovely! I have a question though – does this soap turn out soft? I’ve never made a soap that didn’t include any hard oils (I usually use shea and cocoa butters). Would you advise any substitutions to make it a harder bar if needed? I see a note that says not to use aluminum with this recipe because it the lye will react. When using the Pringles can do you line it with something? I think the can itself is aluminum lined. Have you had any reactions using this method. Hi Jen C! You don’t want to put raw soap batter or straight lye solution against aluminum. Once it has been cooked in your crockpot, it should no longer be reactive and should be fine in a Pringles can. We don’t eat them to have a can handy (they have gluten & 3/4 of my family has celiac), so I haven’t tried it personally. I have heard from plenty of people that use the idea successfully though! Just don’t try it with uncooked cold process soap and I think it should be fine. Thanks for this recipe! I have just made my first batch of hot process soap! I like the idea that you can get away with using less essential oils with hot process. My batch was pretty ugly in the mould – will see tomorrow how it comes out. I thought I could perhaps use the fact that the hot process soap has finished reacting by the time additives were added to add milk powder to make milk soap – what do you think? I will experiment – I made some “Vanilla Cafe Latte” soap for my son a while back using milk powder as an additive, rather than using liquid milk with the lye, to cold process and then putting in the freezer, but I think it may work better with hot process. Only one way to see, I guess!! Is it possible to over stir during the “stir to trace” stage? I stepped away for a minute and my husband was doing the stirring, and when I came back it looks like applesauce. Now it is just so thick and not bubbling up on the sides of the crockpot or anything as it usually does? Does this sound like an over stirring problem? And, is there a way to salvage the soap or what do I do next? Hi Leah! That does sound like you might have stirred a little bit too much. That happens to me sometimes too, and I end up with a really thick trace. When that happens and it gets really thick during cooking, I just get some warm water in a small cup and trickle it in, a bit at a time. Then stir, stir, stir the water in. If it’s a really solid clump, you can try stick blending right over it, with water added. Keep pulsing the stick blender right at the surface and it will break the clump up. I noticed this happened more often with my crockpot that runs a bit too hot, so when I use that one and accidentally get too thick of a trace, I just add a bit more water before I even start cooking it. Is it possible to rebatch hot process soap and if so, what is the process? Mine has hard, white clumps in it…from overheating? Even though it says to do it within 24 hours, I’ve waited longer before and still had it turn out okay. Are the hard white clumps soap or do you think they’re pockets of lye? If you think they’re just soap, it could be where the thicker trace cooked them more solidly first. I’ve had that happen and the soap is still completely usable in that state. If you think that they’re pockets of lye though, definitely try the rebatch method. Do you use any essential oils to scent this soap? If not, is it a pleasant scent without? Hi! I love this recipe; it makes such a lovely soap! That being said, today I completely spaced out and added in my oats, cocoa butter, honey, and water BEFORE cooking it. I was so afraid it would scorch! But…I turned the crock pot on its warm setting and stirred every 5-10 minutes, and while it was a darker caramel color than my other batches, it still smelled really good and seems to have pulled through without any issues! Is there anything I should look out for? Ph tests were fine and it was without lye pockets. Hi! I made this a couple days ago and love it! I actually would like to try your cold process oatmeal and honey recipe next but am wondering why the larger cold process oatmeal recipe has the same and less amounts of oatmeal and honey as this smaller recipe has. Should I increase the oats, honey and butter at trace in the larger recipe and by how much? You should be able to safely double the amount of oats & honey in the cold process recipe (and adjust even higher or lower if you want to experiment – just don’t do TOO much more honey or it will overheat & could make your soap too soft). I have question – I’m making a batch of this HP soap right now and the instructions state to cook in crock pot for 1 hour. Well it’s been almost 2 hours, and when I check for lye, the lye is still really strong. (I use the liquid drops to test for lye). Should I continue to cook even though it’s in a gel stage? Aren’t you supposed to add the EO after the mixture has cooled down? My last 2 HP, the EO hardly stayed and I’ve been reading about flash points. For Lavender, I think it should be ok at 160ish. Hi Jenny! With essential oils in soap, you want to look at boiling points rather than flash points. Hello, I”m back to report that I made this soap and it came out fantastic. I used combo lavendar and peppermint. I also used a pringles can for the mold. It’s the best yet of everything I’ve tried. Thank you so much and I will try more of your recipees!!!!!!!!!!!! I have made this recipe three times before and it turned out great. Today my batch turned a very dark brownish color, I did everything the same but added a little more lavender to the soap. Do you think it was the lavender or possibly the honey. The honey was a little thick but it melted fine when I added it to the warmed oil and water base. I typed up a comment earlier but I don’t see it so I’ll try again. New to soaping, I made this bath and loved the results. Thanks for sharing!! The bar was a little soft so I tried adding some sodium lactate to my next batch. I also added a pineapple fragrance oil. The soap seems a bit spongy or even softer. Do you think it was the fragrance oil? Hi Katrina! Sometimes it takes a week or more for me to get to every comment. :) I’m so glad that you like the recipe! There are two possible reasons for the softness: First, the recipe is pretty high in olive oil – these types of soaps benefit from a little longer cure time to fully harden up. (An extreme case is 100% olive oil castile soap, where you want it to cure for months or even a year, to get a nice hard bar.) 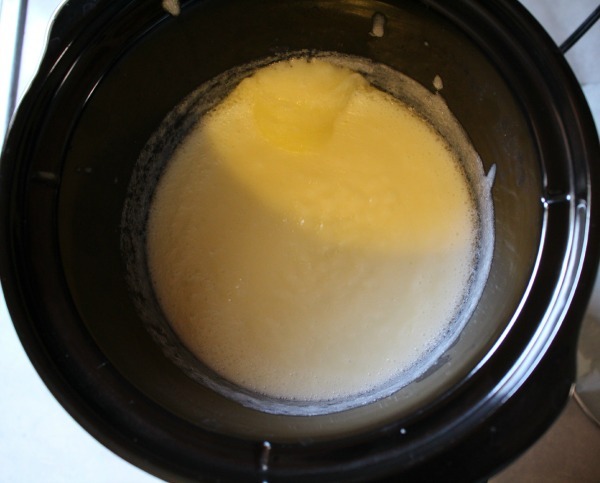 Second, it’s possible that your crockpot is doing an extra great job of cooking the soap without overheating, so you might not need as much water as the recipe calls for. You could try reducing the water amount by 1 ounce or so and if your soap looks like it’s drying too much as it cooks, can always add the water back in then. Sodium lactate can help smooth out hot process soap, but it shouldn’t make it spongy, so I don’t think that’s causing the problem. The fragrance oil could very well be a culprit though! Fragrance oils can sometimes be finicky! Shelf life of soaps varies a lot depending on how fresh the oils you start with are (old oils = soap that goes rancid more quickly), but a general guideline some soapmakers go by when giving away soap is 1 year. As long as it smells good, then it’s good to use! Great, I will try that. Thanks for the info! Just wanted to say thank you for this great recipe! My husband has had problems with acne on his arms ever since he can remember, and since I made this soap, the acne is gone. He absolutely loves this soap! Hi, I’m curious why you grind up the oats. The oatmeal soaps I see in stores all have “whole” rolled oats mixed in; wouldn’t it be just fine to leave the rolled oats whole and eliminate a step? Hi I’m new to soap making.I tried my first batch last night and it seemed to go well until the cooking part.I reached trace and put it on low but instead of bubbling the middle just raised up and got kind of hard.It had a cake look.Do you know what I’m doing wrong? Hello! I used this recipe for my first time making soap. It was so easy to follow your directions and my soap turned out great. The one question I have is, how do I make my soap smell more like honey? It is my intention to keep this a natural and fragrance free soap, but it has an overwhelming oil smell. I tried adding a half a cup and that didn’t really make a difference. Do you have any suggestions? Is there a point of adding too much honey? Thank you so much. Hi Michelle, Hooray for making your first batch of soap!! :) Unfortunately, the scent of honey (and most soap ingredients) doesn’t come through to the final soap very well. Adding more than a tablespoon or two of honey to the recipe will only make the soap softer and darker in the long run. The only option for a noticeable honey-like scent is a fragrance oil, or for an alternative that’s more natural, you could scent it differently with something like lavender or lemongrass essential oil. I have never made soap before (always chicken about the lye), but your recipe makes it seem relatively easy. I have some organic melt n pour I’m going to try first though! Lololo! Hi Lani, Yes! You sure can use individual molds, especially if you’re making melt and pour soap. For cold process soap though, the clear plastic kind of molds are really hard to get soap out of. Individual silicone molds are good though, especially if you’re making salt or brine bars or want to keep your soap cool (to prevent gel phase). For a hot process soap like this recipe, the texture will be on the thicker side, so it won’t as easily and neatly fill individual molds. If you want to try them out, choose a simple mold (nothing intricate) and rap the filled mold firmly against the counter several times to try to get rid of any air pockets. Can I add dried lavender? Any tips/tricks/bewares for adding additional dried ingredients like that? Thanks! Hi Christi! You can sprinkle dried lavender on top of soaps, but if you mix it into soap, it will eventually turn an unattractive brownish-gray. If you want to add dried ingredients, it’s best to add them as an oil infusion for the benefits, or sprinkled on top of soap so they won’t discolor so badly. Thank you for posting this recipe. It sounds divine. I’m going to make it today. I’ve been wanting to try an oatmeal and honey recipe and I have some she’s butter that I’ve been wanting to mix into a soap. Hi Katrina! It looks like you input too much oil weight. The total oil weight should be 27.5 oz. I also superfatted at 5%, to offset the additional tamanu oil. 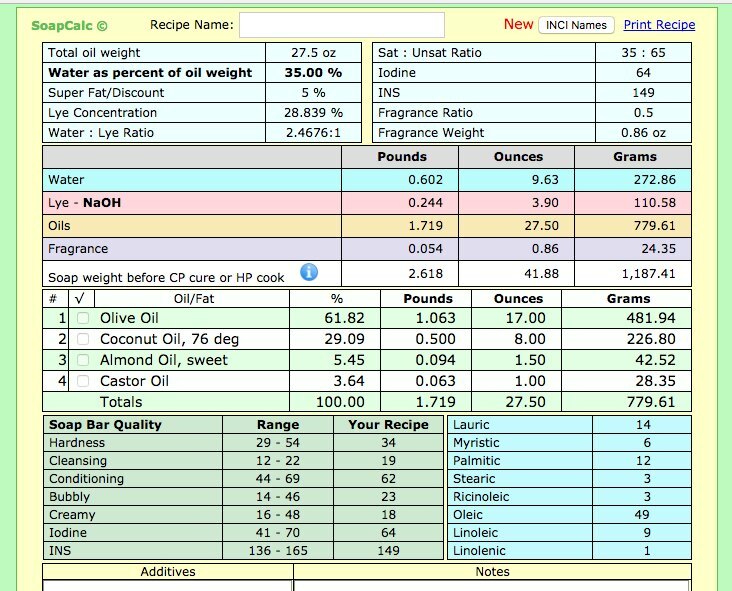 I usually use the lye calculator at Majestic Mountain Sage, so probably used that one to create the recipe, but this is what I get when I input it in SoapCalc. Thanks for the reply Jan. I just wanted to let you know that I made this recipe and the soap turned out great! My family loves it and its so soothing and luxurious. I love the addition of the honey at the end. The soap feels amazing! The soap cutter is perfect! Did you make this or was it purchased? Just made Oatmeal and Honey soap . I made this soap exactly as suggested except I used violet leaf infused olive oil. I cooked it an hour, checking it every 15 minutes. It is soft and when I press it I think I get a bit of oil. I can cure it indefinitely and will do so. I do want to understand why it is squishy. I cooked it on low in a standard crockpot. Thank you!? My first thought is something might be up with the lye. When soap is still oily feeling that long out of the mold, it often means there wasn’t enough lye for the amount of oils. Did you use a new bottle of lye or have you used it before with good success? Did you spot any lumps or clumps in it when pouring, or if you shake the bottle, do you hear any chunks of lye rattling around inside? If so, that can indicate that the lye has gotten moisture or humidity inside somehow or is past its prime and it won’t have the full activity that fresh lye has. Another thing that could make a difference is if some of the lye settled to the bottom of the lye solution container and didn’t get completely mixed into the water. When you poured the lye solution into the oils, did you notice a hard layer of lye stuck to the bottom of the mixing container? If reduced lye activity is the cause, then the soap won’t be dangerous to use or anything like that, but it will be extra superfatted (ranging from oily feeling to extra moisturizing) and lather/use might be affected. Have you tested its lather yet? How is it when you use a small piece to wash your hands? One other thing that can keep your soap soft longer too is if you’re having lots of hot humid weather. Sometimes if that’s the case, the soap might sweat out little beads that look like oil, but comes from the glycerin in the soap absorbing moisture from the air. Humidity can make cure time slower too. What you could do if you think high humidity is a factor is set the soap aside for a week or so where it can get lots of air circulating around it – in front of a box fan could work great. Then check it and see if the texture has improved any, or if it still feels oily. Keep me posted on how it does! YOU MADE. MY DAY! I literally checked my soap and felt crestfallen. I am off to test the lather. I am in Chicago and it is humid. I just cut a piece off of the bar and it is SUPER EASY to cut. I washed my hands and the lather is great; it feels silky and I have no sensations that suggest lye irritation. I can smell my lemongrass essential oil. It is wonderful save for the texture. I took a picture and will try to get it on FB. Thank you so much! I intend to stick with this. I feel mildly proficient at CP. now to get better with HP. ☺️??? Hi there. Can this soap be made using the cold process method? Hi Jan, I just want to say that (I thought it was on this chat though I can’t find it.) you gave me a similar recipe that included honey with a CP method for my dog. I wanted to let you know that I made it and it is WONDERFUL! When I have an idea for a soap, or bath bomb, I always go to your books and blog for a recipe first and they are always winners! Thank you so much. Hello! I have a quick question. I scrolled through the comments and didn’t see if someone asked this so if they did, I am sorry for a repeat. I have had several requests for a milk soap and although I don’t have access to a goat I thought perhaps coconut milk would be nice. I also thought using it in this recipe would be especially nice. Have you or anyone else used milk in place of the water in this recipe? Thanks for your time and I love your site and am getting ready to purchase the Natural bath care package! If I were to leave out the lavender essential oil would this soap have any scent of its own? Even if it’s just a soft scent. Hi Jan, I made this but forgot to add the last bit of oil at trace. you know the tamanu or rose hip seed oil. Will it still be okay to use? Other than that over site they seem to have come out just fine. Thanks! I love your website and all of your tips. I recently have been making a variety of soaps but my husbands favorite is the hot process Honey Oatmeal soap no EO just plain soap. Thank you!!!! That is a relief! I tried making the honey oatmeal soap for the first time tonight and I’m not sure if it’s going to turn out. I have a crock pot question. Going by the pictures of how the soap should look at 15-30-45 minutes mine didn’t look like that. It was 30 minutes before it started bubbling on the sides. I left it cooking for an extra 45 minutes and then let it cool for 15 minutes and added the rest of the ingredients. Do you have any ideas. (It’s a hot crockpot). Would it matter that I measured the coconut oil as a solid? Hi Julie! How is your soap looking today? Just double checking – did you use a scale to weigh the coconut oil or a measuring cup? 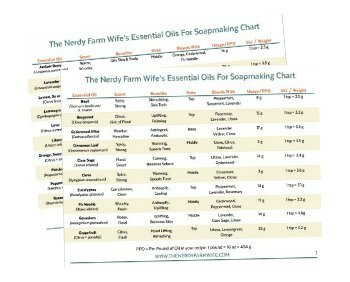 You want to use a scale and weigh all soapmaking ingredients like oils, butters, liquids, lye. If you did weigh the ingredients, then the coconut oil will weigh the same whether it’s a liquid or a solid, so the soap should still be good to go. Some crockpots just take longer to heat up the soap sufficiently, so that could’ve been the case. I have a question about the oatmeal. When you say to grind it fine will oat flour work, or is that to fine? 2nd Topic… Can I use goats milk with this recipe?I’ve only made one batch of soap, so I a new’be:) If I can use goats milk how would it affect the overall softness/hardness? Would I have to change the lye amount? Thanks so much for your help. Just made this soap recipe. Only added Shea butter. I can already tell that this soap will be my favorite. Thank you for such detailed instructions. Hi Carmen, That sounds like a wonderful addition! I’m glad you enjoy the recipe! Can you use food coloring to change the color? Hi Dusty! Regular food coloring won’t work well in soap – the alkaline environment can alter the colors, plus it’ll stain your skin. 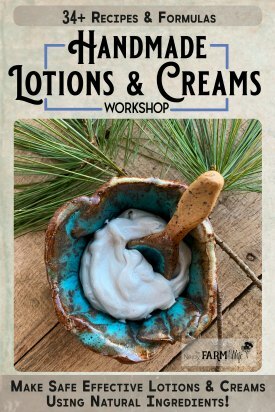 Im new to soap making and wondering are there any differences if im just using a stove top cooker rather than a crock pot? Has anyone had any issues doing this. Will using lye in my crock pot ruin it to use later for food? Hi Christal! Using it just once usually won’t be a problem, but after several uses, the crockpot will get etched lines in it from the stick blender and lye. I ordered all my ingredients from Amazon and everything is here except for the castor oil. Even though it said Prime Shipping, the seller didn’t honor it. >:-( My question is this: Can I substitute another oil for the castor oil in the recipe? I have extra of all the oils called for in the recipe. I also made a mistake and ordered both rosehip seed and tamanu oil. Could I use the rosehip seed oil in place of the castor oil without having to adjust the amount of lye (or ruin the soap, lol)? I’m excited to try this method and recipe. Just wonder if I could use beer in place of the water. My kids own a brewery and we’d like to try making soap with it. Thanks! Hi Pat! Yes, you sure can use beer instead of water. What you want to do first is leave the beer out & uncovered until it’s flat. Some people also boil it for 10 minutes to help remove residual alcohol. Next chill it in the refrigerator until it’s completely cold then proceed with the recipe. The natural sugars in beer tend to really heat things up, so keep an eye on the soap while it’s cooking. If it starts rising up in the crockpot, stir it down so it won’t overflow or “volcano” out onto your counter. Good luck with your soap! Hi. Would it be ok to add a little dried lavender? If yes, at which stage should I add it please? I have never made soap before but I’m excited to try! Thank you for providing us with all of this lovely, valuable information! This recipe only yields 27.5oz according to any calcs i have plugged it into. Am I missing something? Hi S! Yes, that’s correct! This recipe isn’t a full 28 oz like most of my other recipes. Did I accidentally write 28 oz somewhere? If so, let me know & I’ll fix that. Thanks! Ah, I see what you’re saying. My brain was thinking oil total instead of entire batch yield total, so my first answer isn’t accurate. The oil total amount in this recipe is 27.5 ounces. However, that’s not the total yield of the soap, since you also have to account for water and lye weight which is significant. If you add those together you get around 42 ounces as the soap yield. “Soap weight before CP cure or HP cook” then it gives the total in pounds, ounces and grams. Final yield of the soap batch will depend on how much water discount you use – more water will equal a heavier soap number. I used your recipe for Honey Oatmeal Soap for my second batch of soap and it turned out beautifully. Thank you for such clear directions! I am officially a soap addict now! I would like to try putting a pretty stamp on my soaps. When do I do this? Immediately after I cut it or later? Any tips or tricks? Thank you. I love your web page! Hi Susan, I’m so happy that you had good success with the recipe! :) For stamping: When to stamp depends a lot on the type of soap you’ve made and how hard/soft it is when you cut it into bars. It could be a few hours after slicing into bars or up to a few days later. 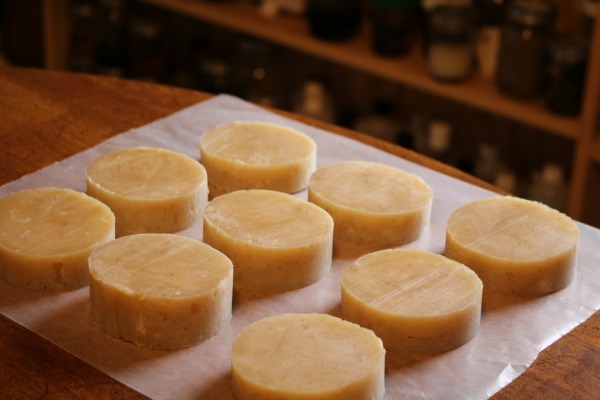 Harder soaps with lots of butters, tallow, lard or coconut oil (or harder because of sodium lactate added to the lye solution) will be ready to stamp sooner than castile soaps or those made with high amounts of olive oil and/or a full water amount. To avoid accidentally stamping too early on soap that isn’t ready, you can use end pieces as a canvas for test stamping. If the first attempt results in the soap sticking to the stamp, wait several hours or a day longer before trying again on that same test bar. It’s one of those things you have to practice a lot and get the feel of soap that’s at a good stage. Someone once described the perfect texture as being similar to pressing on a block of colby jack cheese (firm but with a little give to it) and that’s a pretty good description! I’ve just did my first ever soap making attempt with your recipe and I loved the process. The only thing i’m a little insecure about is the hardness of the bars. Mine seem to dent a bit when I press my finger in them. So they are not hard solid bars, but a bit like thick clay. Is that a bad sign? Should I leave them to dry out more?